I had set a goal time of 2:17. I missed that by a long shot. Honestly, I didn’t really care. 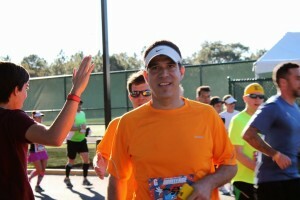 I quickly realized that this was a running EVENT for me and not a running RACE. 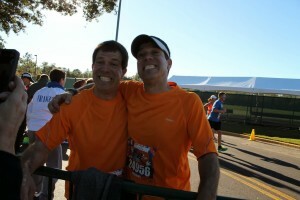 Michael and his brother, John, ran with me since they had signed up for the Goofy event. 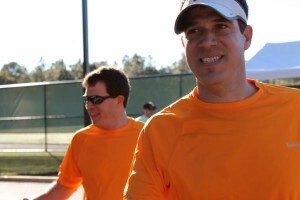 The idea was that they would run easy with me on Saturday and then run hard the next day. They weren’t counting on all the starting and stopping required by the crowds as well as all the off-road running in order to pass people. 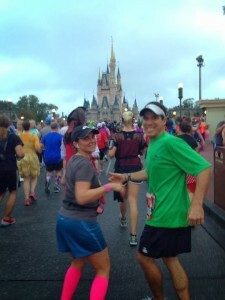 So they ended up being quite sore and had trashed legs for the marathon the following day. Oops! But I digress. Back to the race! Disney just does everything so well. 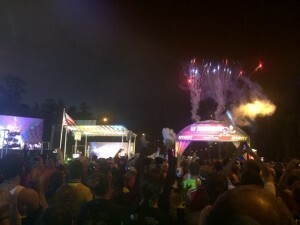 There were Disney characters, cheerleaders, high school bands, huge TV screens blaring music, cast members cheering, volunteers passing out water and Powerade, and spectators ALL along the way. In the half you run through two parks, in the full you run through all four parks plus ESPN zone. But again, I’m getting ahead of myself. 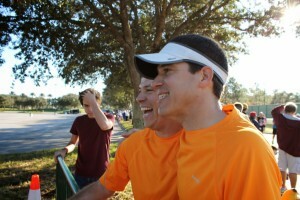 Did I mention that there were 16 corrals? They started with A and went through P. Yes, we were in corral P. We couldn’t even see the start line or hear the announcers where we were. We had to walk quite a ways to even get in position. 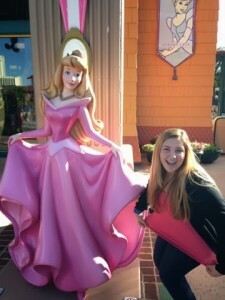 Disney had trash boxes set out along the way for garbage, recycling and clothes. 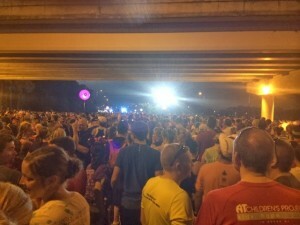 This is what it looked like standing in Corral P for over an hour. Each corral had their very own start complete with fireworks. 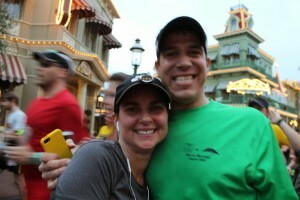 The first of two highlights of my race was seeing Annie on Main Street. I’ve gotta brag on her a little bit. She figured out on her own how to come find us, by herself! 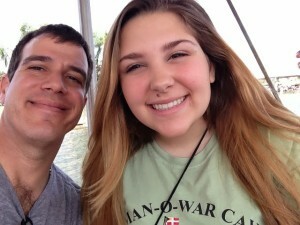 First, she walked to the front of the campground, then she caught a bus to the back of the campground where she caught a boat to the Magic Kingdom. She texted us her location so we could look for her. It turned light while she waited for us for almost an hour! So happy to see Annie! 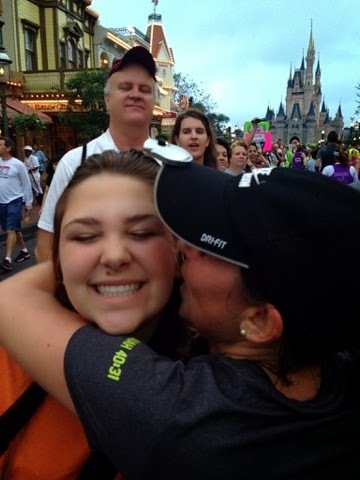 It was an overwhelming feeling to hug her mid race in the midst of that sea of people. 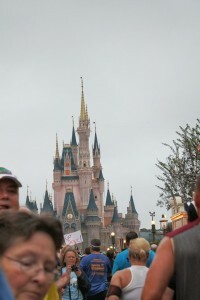 She tried to find us at the castle, but I didn’t know to look for her (missed that text). 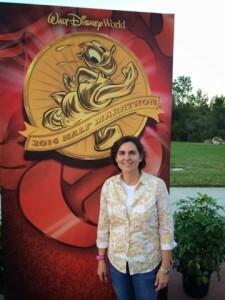 She then caught the monorail to Epcot so she could see us at the finish line. She wormed her way to the front of the line and again texted us her position so we could spot her as we came out of the park. 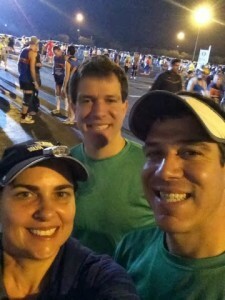 The second highlight for me was running into Bob and Prudence along the routes these are friends of ours from church who were also running the Goofy. 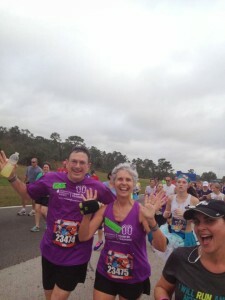 We happened upon the around mile 9 and ran with them for a few miles. Those miles just flew past! 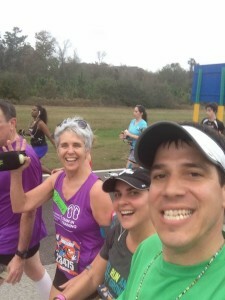 It’s so fun to run with friends! The best part was finishing. 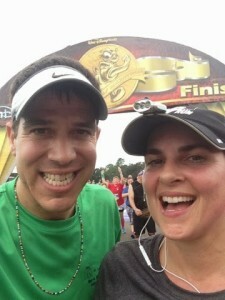 I so enjoyed running and finishing with my husband. That was a first for us! And at the very end Timothy met up with us. Felt great to be done! 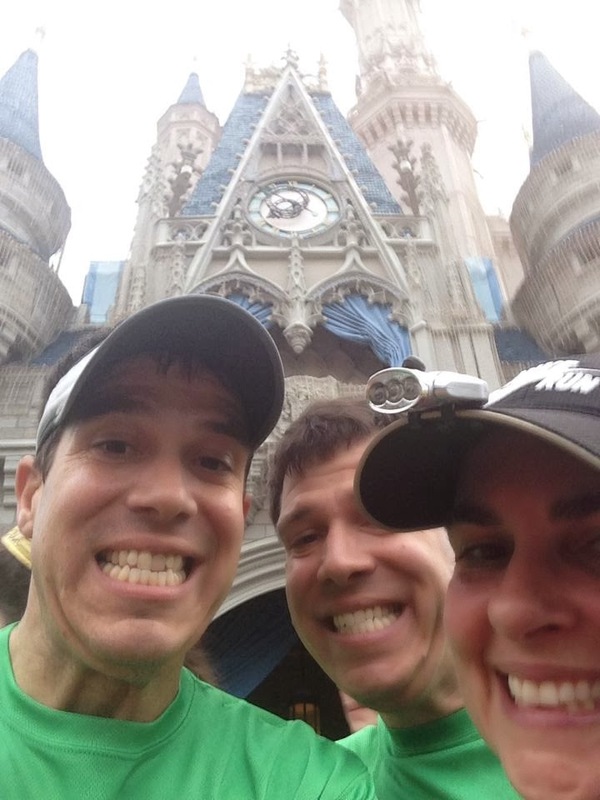 The next day the three of us got up early to cheer for the twins during the marathon but we kept missing them at different points (Magic Kingdom, Grand Floridian and Polynesian). 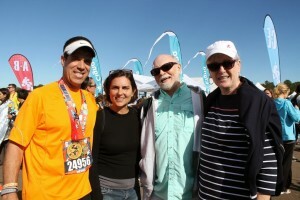 We finally met up with them at mile 18 at ESPN zone. Timothy handing out high fives! At the finish line we were able to connect with old friends. (Love those cell phones!) He was our priest from our church in Tampa and I had worked with his wife as a classroom assistant in her 5th grade class. It was so sweet to see them! 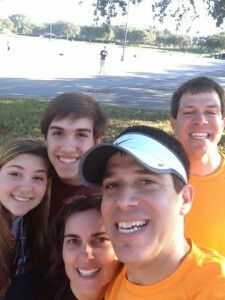 They had read our Christmas letter and knew we would be in Orlando for the race. 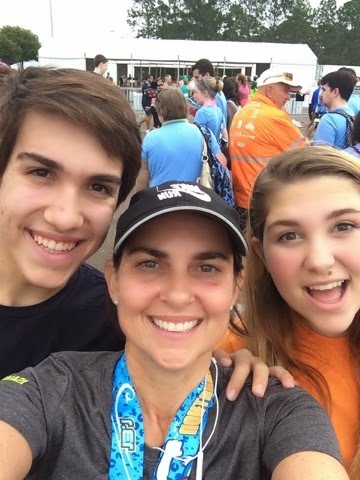 Since their son was doing the Dopey Challenge, we were able to connect! 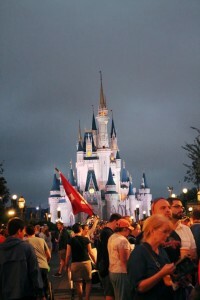 All in all it was a great time at Disney! 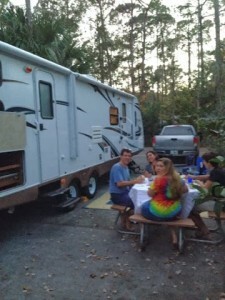 Although it’s hard to be there and NOT go to the parks, we still enjoyed hanging out in my brother’s RV at the Ft. Wilderness campground, riding the monorail and the boats around, shopping at Downtown Disney and eating at Trail’s End restaurant. Now I want to run another half marathon so I can hit that goal time! Way to go Guys! What a wonderful weekend! Makes me want to go run! !